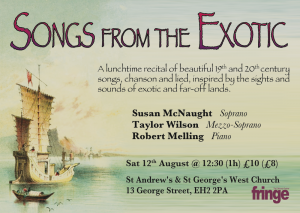 A lunchtime recital of beautiful 19th and 20th century songs, chanson and lied, inspired by the sights and sounds of exotic and far-off lands. Taylor Wilson: ‘Something really magical happens when a piece of music finds a performer whose talent matches it to perfection.’ (Alan Cooper, Herald). ‘Robert (Melling) plays all three works with total mastery and conviction.’ (William Headley, MusicWeb International). ‘Susan McNaught’s Ida is a vocal tour de force.’ (Kenneth Walton, Scotsman).